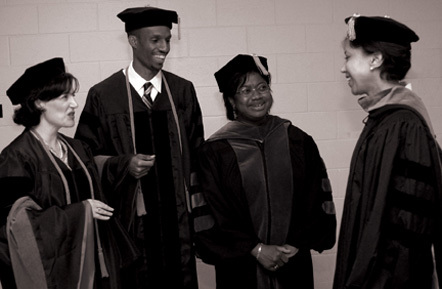 Left to right: Graduates Mary B. Shuping and Vaddrick Q. Parker; the Honorable Allyson Duncan, judge for the United States Fourth Circuit Court of Appeals; and Janice Mills, dean of the North Carolina Central University School of Law. This photograph was taken at the 2004 graduation of the North Carolina Central University School of Law. Mary B. Shuping went on to become assistant district attorney for North Carolina’s 25th Judicial District, a member of the North Carolina Rules Review Committee, and a member of the North Carolina State Ethics Commission. She has nearly two decades of experience in State government, primarily as a researcher for the North Carolina General Assembly. She is currently a lawyer in private practice in Raleigh. Vaddrick Q. Parker, who also received a masters in business Administration from Arizona State University, returned to North Carolina and now has his own Raleigh firm specializing in business and legal advising to entrepreneurs. Janice Mills was dean of the law school from 1998 to 2005, during which time she increased enrollment and oversaw the School of Law’s temporary move to the North Carolina Mutual Building during a renovation of the Turner Law Building. Allyson Duncan, a Durham native and graduate of Duke University’s School of Law, taught property, employment discrimination, labor law, and appellate advocacy as an associate professor at the North Carolina Central University School of Law from 1986 to 1990. She was the first African-American judge to sit on the United States Court of Appeals for the Fourth Circuit, and she has served as an associate judge of the North Carolina Court of Appeals. From 2003 to 2004 she was president of the North Carolina Bar Association.